Photoshop is an incredible tool that comes with hundreds of functions. We adapt Photoshop to our needs and we normally end up using just a few of them. But, how many times a day we use each tool? How many times a day we repeat the same sequence of commands? Wouldn’t be great to improve and automate the way we use our tools? Photoshop has a built-in powerful automation feature called Actions. Photoshop actions allow us to record a sequence of actions and then run that sequence whenever we want with just one click from the Actions panel. And even better, we can assign a keyboard shortcut, making the process even faster. Merging several steps in one saves you time. You can create complex workflows concatenating actions. You don’t need to remember the details and steps to achieve a particular result. Record an action and the process will always be available within a click. You can bulk edit images using the powerful File > Automate > Batch. I want to share with you some of the actions I use every day. You can download and adapt them to your own needs. To import them first activate the Actions Panel (Window > Actions) and then import my actions using the options of the Actions > Load. I use Photoshop CC, but the actions might work as well in older versions. My website needs 4 different sizes of every image I upload. I coded it in that way to work well with Retina Displays and also to help to load the website fast. This action exports to the desktop the four images sizes I need. The sizes and formats are very specific to my website, but you can adapt it to your needs. 3- Change image size to 1220px wide. 4- Export a PNG to the desktop and name it [email protected]. 5- Go back to the step nº2. 6- Change image size to 610px wide. 7- Export a PNG to the desktop and name it magoz.png. 8- Go back to the step nº2. 9- Change image size to 760px wide. 10- Export a PNG to the desktop and name it [email protected]. 11- Go back to the step nº2. 12- Change image size to 380px wide. 13- Export a PNG to the desktop and name it magoz-thumbnail.png. 14- Close the file without saving the changes. I end up having lots of layers, and the most of them are hidden or empty. This action cleans the .psd file. As I work with a few colours and every layer contains only one shape and one colour, this action is extremely useful for me. 1- Select all the contents of the current layer. 2- Create a new layer. 3- Fill the selection on the new layer using the foreground colour. When I draw, I don’t manually fill all the shapes. I usually only draw the outlines of shapes. Then I select the inside using the magic wand and fill it. But, this approach has a problem, you must expand the selection before filling it to avoid a small area that is not filled. 2- Fill using the foreground colour. I use the flipping function a lot, and this small action saves me a couple of clicks every time. 1- Duplicate the current layer. 2- Flip the new layer. This action is fundamental when I’m choosing or tweaking the colours of a new illustration. I usually copy the image and play with some adjustments as Hue Saturation to experiment with the colours. This action creates a new layer on top of the document with the full image and also opens the Hue/Saturation dialogue. 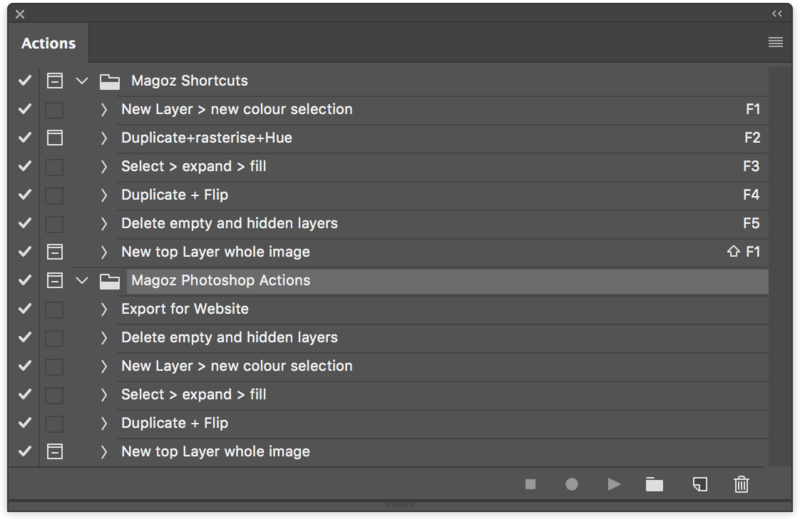 3- Merge all duplicated layers in one. 4- Open the Hue/Saturation dialogue. I also use actions for other scenarios. Here are some ideas. When I need to export more than 5 images in a particular format (for contests, print or media, for example), it’s very fast to set up a new action and execute it using File > Automate > Batch. You can define the source folder and the destination folder. It works like magic. I have an action to export an image in 2000px PNG RGB. I always send the sketches with those specs. Every action I use has assigned a keyboard shortcut, which makes the whole process even faster. I started using the Photoshop actions a few months ago, and it has completely changed the way I use Photoshop. I’m always looking for ways of improving the way I interact with technology, and actions in conjunction with keyboard shortcuts optimise to the maximum the way I use Photoshop, making frequent and complex actions very fast. Do you use actions? I would love to hear your ideas and thoughts and, if possible, share the ones you use in the comments. Let’s optimise our workflows together! Que bueno, compartiendo recursos! Gracias!! En uno de tus post hablabas de como te gestionas el tiempo, y la verdad es que lo estuve chequeando.. en fin, vi que apuntabas los Awards, es algo que yo no acostumbro a hacer, apuntarme a estos “awards”..Mira que es importante! Si te van tocando algunos, van dándote ese empujón que se necesita. -(Seleccionas a mano la parte de fuera del dibujo).. Expand selection 3-5px, Invert selection, New layer, Fill..
Este puede ir muy bien en caso de que trabajes con línea, porque rellenas sin que sin defectos..
Una vez mas, gracias por compartir! El tema de los concursos creo que es interesante. Es cierto que cuesta dinero y que puede llevar a discusiones morales, pero yo lo considero una inversión en visibilidad. Gracias por el aporte de la acción, me parece muy buena, seguro que le va a venir muy bien a todos los que usan línea. Yo al trabajar sin línea hago algo muy parecido teniendo que expandir la selección de relleno. ¡Que viva la automatización y la optimización! I have a folder for base actions (for things like scaling and cropping) and one for more detailed actions such as texturing/colour effects (even animation for GIFs). As much as anything, actions are great for detailing how you did something, and obviously you can tweak individual ones if you want to change them. And as ever, naming conventions and folders helps this greatly! Woah, I’ve never thought about using actions to animate, but it makes a lot of sense since pre-moves and duplicating layers can be defined. I’m very curious about it, how do you use them specifically? Muchas gracias Magoz, por ser tan generos! Me encanta tu trabajo y estoy aprendiendo mucho de tí. Me alegro mucho que encuentres estos artículos útiles. Very nice! Thanks for all your informative posts. I use actions for many of the same things, but you’ve given me some new ideas. I use it quite a bit, but for your use you would still need to open the Hue/Saturation dialogue. Thank you for sharing your thoughts, Jay. I didn’t know about his shortcut. It’s amazing how many things we can do with shortcuts in Photoshop. I’m planning to write an article about the shortcuts I use, soon. I look forward to that. Thanks!